The pattern and the future fabric. I bought this pattern for the jacket. While I was sourcing supplies for the jacket, I read the directions… for the shirt. I liked what I saw – this was an interesting top, with interesting lines, and some sewing techniques that I wanted to perfect. Eventually I’d like to make the shirt with the rust linen/silk from Urban Zen fabric in the picture, that I obtained from Emma One Sock in 2012. In the meantime, I thought I would test drive it in a white shirting (with a little lycra), also from Emma One Sock just languishing in my stash. I haven’t completed a button down, collared shirt in years. 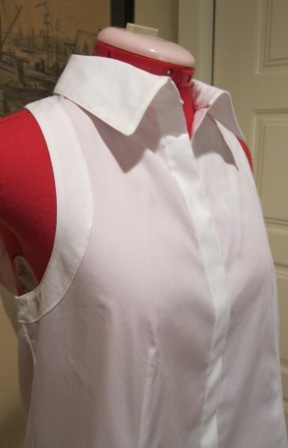 I want it to look perfect, from the collar points, to the topstitching, to the button holes. Well, this one isn’t perfect, but I’m pretty proud of the result. All I can say is that with this pattern, precision/accuracy really, really matter, so measure well and baste, baste, baste! Close up of the back left shoulder. I love these details. I took the pictures on the dress form after laundering and re-pressing. I had to launder because I made the mistake of using yellow chalk for marking. Even though I preshrank this fabric, many of the wrinkles you see could not be eliminated. I will wear this in a day or two, and hope to post a picture of it on me. Pattern Description: From Vogue’s website: Top has collar, collar, back and armhole bands, yoke back, mock front band, bias hem facing and conceal button closing. A and B: semi-fitted. Sizing: 6-8-10-12-14 (Really – five sizes on one pattern? This makes cutting a challenge, when it’s difficult to distinguish between the sizes on the curves; accuracy is critical on this pattern). Because this is not really semi-fitted – loads of ease below the bust – I made a 10, instead of a 12. 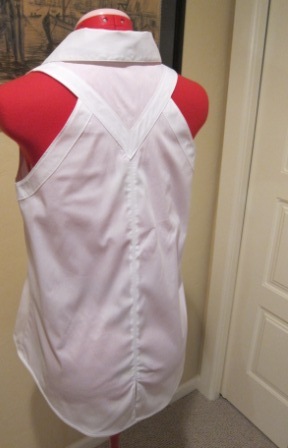 Recently I’ve been thinking of making 10’s for the bodice to better fit the back and shoulders. This worked – the fit was much better, and the armholes didn’t gap. I did not add the usual 1.5 inches in length, because this has no defined waist. Machines and Tools Used: Janome Threadbanger 12, edge-stitching foot, 1/4 inch foot and all the other minor tools in your arsenal. 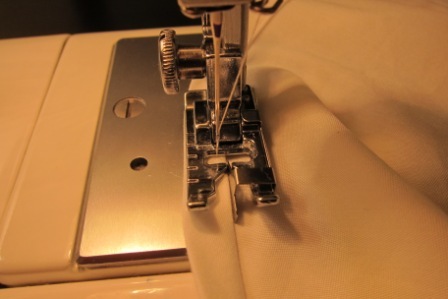 Using the edge stitching foot to understitch. Tips Used during Construction: The Vogue Sewing book. How were the instructions? I followed them to the letter. Not what I normally do, but this helped me be more careful. The instructions were pretty good. Construction Notes: Precision, precision, precision. And baste, baste, baste. I used a small stitch (1.5) and went very slow. I had trouble lining up the side seams, but when I folded the pattern to put it away, I notice I cut the front hems at a 12, and the back a 10 (darn multisize patterns). The french seams in this top are the narrowest I’ve ever made (first sew a 1/2 inch seam wrong sides together, trim and continue, whereas I’ve always done a 3/8 inch wrong sides together, trim and continue). I hope they hold up – the narrow stitch should add some strength. I also had trouble getting everything to line up perfectly on the shoulder seams – I don’t know why, but I pulled out one shoulder five times. It’s still not perfect, but it’s far less noticeable. Last, the bands add to the distinctiveness of this shirt. 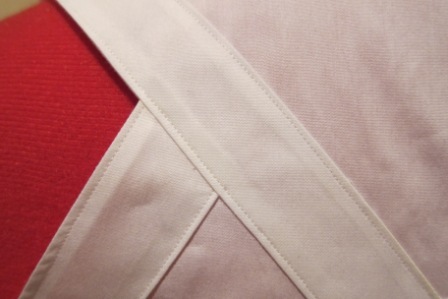 For each, you fold and press the seam allowance, then pin to the bodice, baste and edge-stitch onto the shirt. There must be an easier way to get accuracy, but this was time consuming to get perfect (plus a few steamed fingers). I think I should have thread-traced the seam lines to make this easier to fold over. BTW, I found the edge stitching easier to do consistently with the edge-stitching foot (also worked well for understitching as in the photo). Dozens of button holes in practice and I still get puckering! HELP! One last thing. I’m a novice with the button holes. 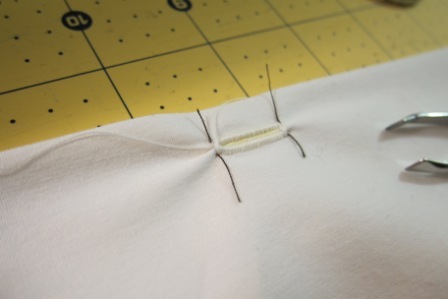 My machine is pretty basic, with the 4 step button hole process. This requires careful marking. But even though I practiced a dozen or so time, I got pulling every time as in the photo. The only thing I can think of is that the plackets are not interfaced, as per the instructions. I’d recommend some light interfacing here- unless someone has a better idea? Likes/Dislikes: I really like it and I love that the top is fully finished on the interior. Would you do it again? Would you recommend it? Yes and yes. But, make sure you focus on accuracy! This entry was posted in Contemporary, Tops and tagged Vogue, wardrobe. Bookmark the permalink. 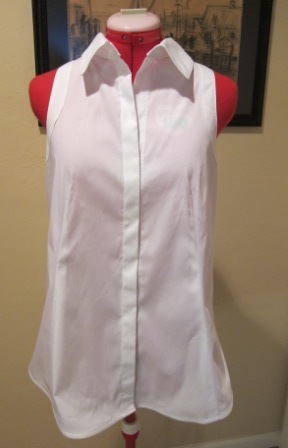 I made the shirt and slid a small rectangle of sew-in interfacing under each button hole, inside the placket. That did the trick. I was thinking that was the way to go. After I made them, of course! Thx. I stumbled onto your post from the EOS Gallery on Facebook. I think you did an amazing job on this top! I bought this top because it’s one of the things I want to make for my cruise in July. Thanks for showing me the way! Thanks! I found taking my time mattered a lot. Also, I’ve decided that I like this tucked in better – I have narrow shoulders relative to my hips, and the cut of the armholes and angle of the darts accentuates the pear.